This is a bluetooth dongle kit. 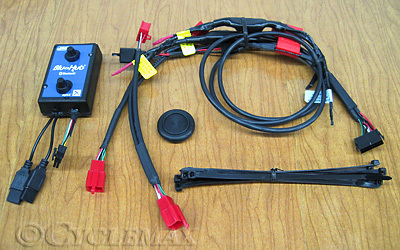 It is made by J&M and is designed specifically for the Goldwing GL1800 and F6B models. This brand new BluHub dual-module Bluetooth Dongle kit features the CSR/Qualcomm BlueCore8 IC chip-sets and is loaded with J&M’s exclusive JMAHP software profile for installation into all 2001-2017 Honda GL1800 and F6B models. This new J&M BluHub dongle will also link to most brands of Bluetooth helmet headsets available in the marketplace today and provide mono audio to the headset with simultaneous and continuous mike signals back to the audio system, for full intercom and CB radio communications. The factory handlebar & dash-knob volume controls will raise and lower the music, intercom & CB volume levels inside each Bluetooth headset, once linked and adjusted. Either driver or passenger can also link their own cell phone to their individual J&M Bluetooth headsets, simultaneously with this BluHub dongle, for automatic switching back & forth between stereo music/intercom/CB and individual cell phone conversations. With this J&M BluHub dongle system installed, CORDED helmet headsets can still be used at any time thru the standard headset connection plugs, simultaneous with either of the Bluetooth headset links. The BluHub dongle will turn on and off automatically with the motorcycle ignition and there are NO BATTERIES EVER, to charge or replace. This BluHub dongle kit is 100% plug-n-play into the GL1800/F6B as a permanent and secure installation inside the left fairing pocket location. The BluHub dongle is a snap to remove and plug into any computer via the standard USB port, for software updates direct from the J&M website should they be needed.